Royalty Claim Investigation: Is Google Willfully Refusing to Use Its Own Assets to Identify Copyright Owners? Issue: Is Google willfully ignoring its own assets -- YouTube Content ID and its DMCA takedown records -- to avoid identifying copyright owners in songs made available on Google Play Music? Since mid-2016, like many other services, Google has been filing millions of Notice of Intention to Obtain a Compulsory License statutory notices ("NOIs") on the US Copyright Office in accordance with the Section 115 provision of the US Copyright Act. 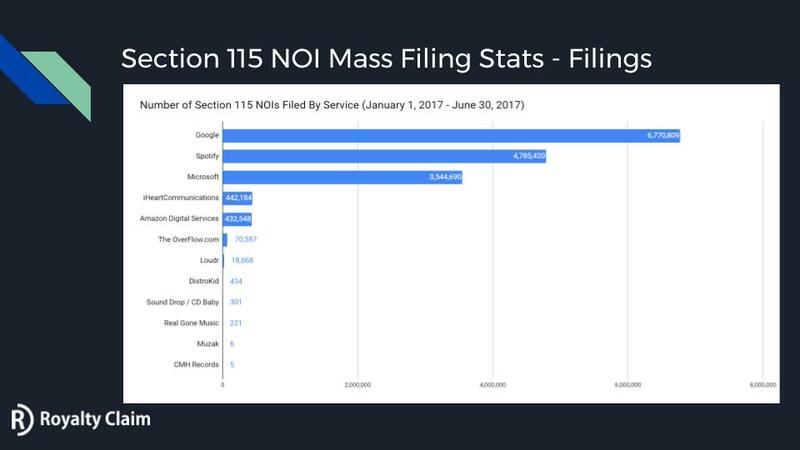 In the first half of 2017 alone, Google has filed nearly 7 million NOIs. ‍A slide from the "[Preview] The State of Unclaimed Royalties and Music Licenses in the United States" presentation at MIRA Conference. Among the many problems with this policy and procedures is the way in which NOIs are filed and the burden put on copyright owners to find their specific NOI. NOIs are electronically filed in mass. Effective April of 2016, prospective music users (licensees) were able to begin electronically mass file NOIs. 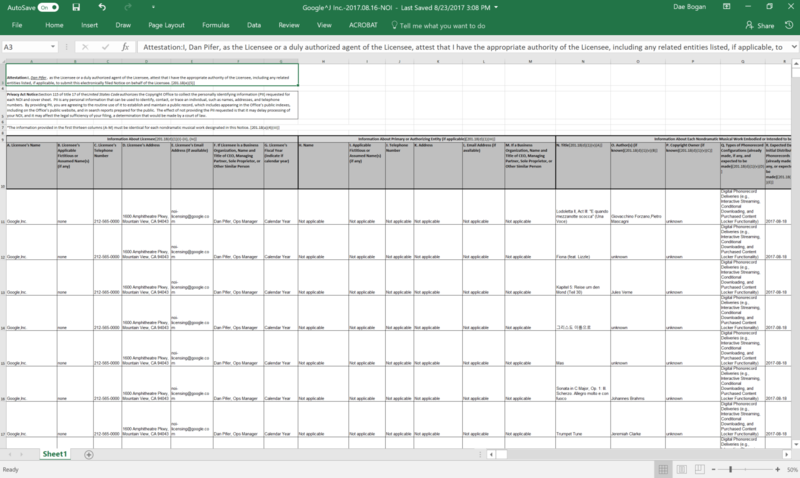 In this method, NOIs are indicated as a single row of a MS Excel spreadsheet with a maximum of 200,000 rows (or 200,000 NOIs representing 200,000 musical works). That's right, an NOI is literally one (1) of each rows of a 200,000 row MS Excel file, which is placed into a folder with up to 7 other MS Excel files (each with up to 200,000 rows/NOIs), then zipped, and after it has been processed by the USCO Licensing Division, posted on a webpage that most copyright owners have never heard of. Recently, Google has filed MS Excel files with encoded security making it difficult to use. The downloaded MS Excel files are locked from editing, which disables a user's ability to select a row, column or field; disables the copy function; and disables the go-to-field behavior after a Search and Find query, rendering the file virtually unusable by the average copyright owner. (Royalty Claim Initiative's has developed technology to process these files and make all NOIs available in our database for easy search). Nevertheless, this process is perfectly legal under the copyright law of the United States when a licensee claims that it has not identified the copyright owner in a musical work. After this filing, it is a copyright owner's responsibility to 1.) make itself aware of the filing, 2.) find its needle-in-a-haystack NOI, and 3.) act on it. RCI researchers randomly select and investigate Section 115 NOIs that are imported into the Unclaimed Licenses database of the Royalty Claim Platform. On August 23rd, 2017, we randomly selected an NOI for the song "Down the Road" by Dead Day Revolution. The NOI was filed by Google on August 16th, 2017 among tens of thousands of other NOIs filed by Google that day. Since NOIs are supposed to be filed by licensees on the US Copyright Office only when the copyright owner is unknown, we wanted to see if we could find the copyright owner ourselves. And because we wanted to test a hypothesis -- Google does not leverage its own resources to identify copyright owners -- the first thing we did was search for "Down the Road' on YouTube, a Google property. We searched and found a YouTube Music art track for "Down the Road," which was published on August 17th, 2017 by Believe SAS. On this release, YouTube lists the author and composer as "Michael A. Sandoz" and master copyright owner as "Distorted Records." 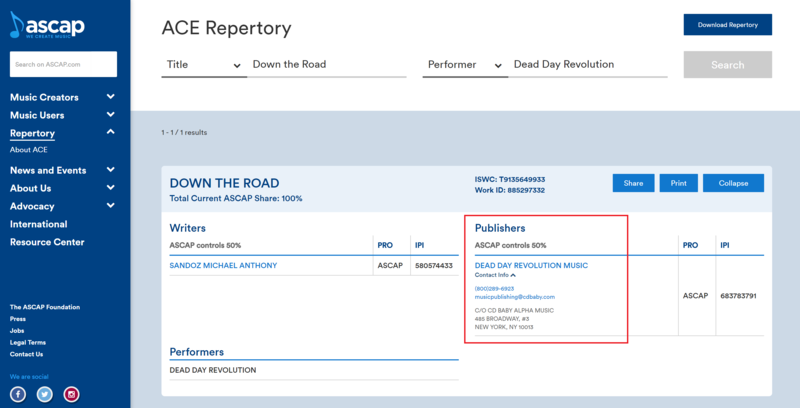 We later learned that Dead Day Revolution is the real copyright owner in the master and not Distorted Records, but that's a separate issue of erroneous metadata, which general leads to attribution issues and could affect the allocation and distribution of royalties (see our Unclaimed Royalties database). 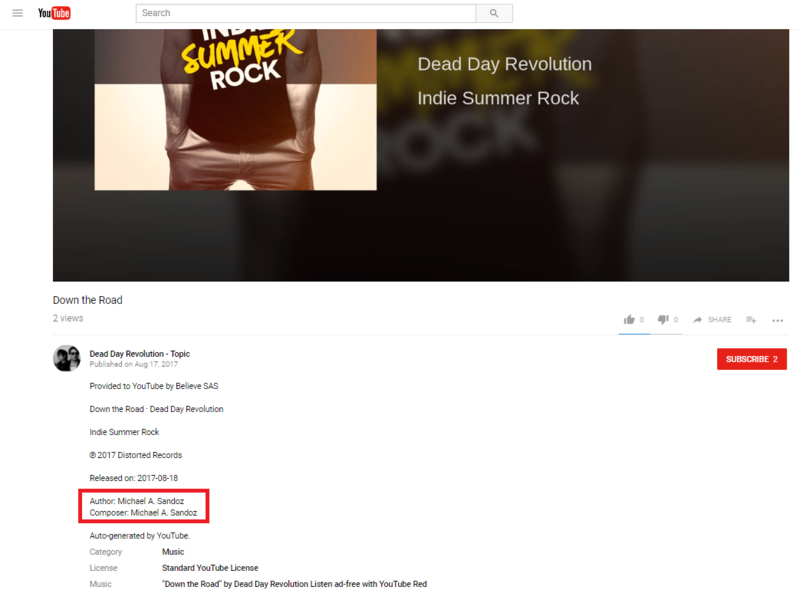 Although we could not see the copyright information on Google Play Music, on Spotify the copyright owner in the song and master is listed as "Dead Day Revolution," which suggests that Dead Day Revolution's distributor, CD Baby, included this information in the metadata that it sent to all DSPs, which would include Google Play Music. Interestingly, the album was first distributed in 2016, over a year before the NOI that we are investigating was filed. 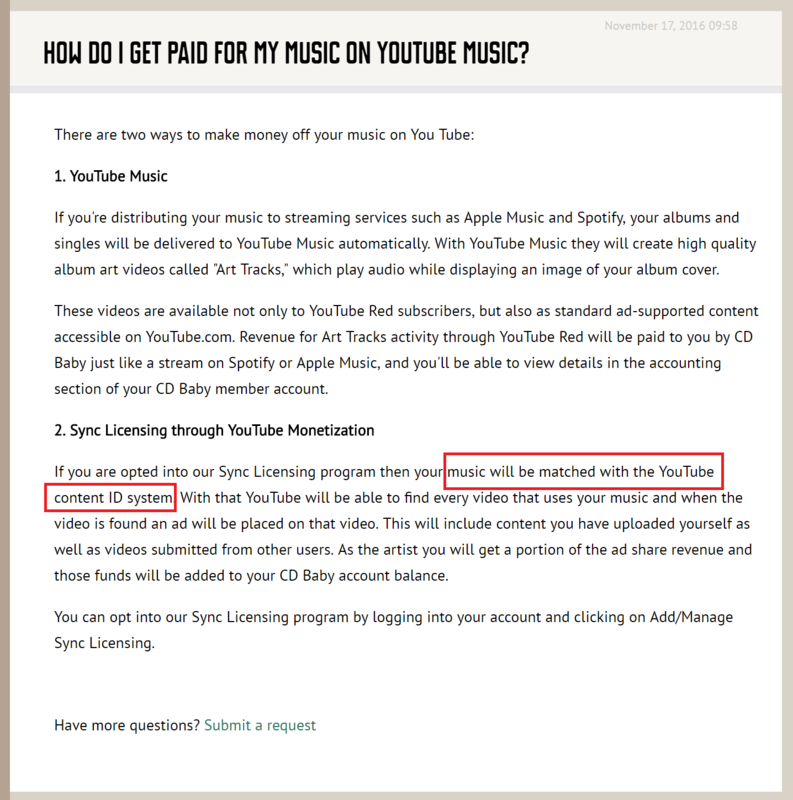 One could argue that viewing the metadata with copyright information clearly posted on Spotify in 2016 does not prove that Google Play Music also received the copyright information from CD Baby. Fair enough. However, even if Google Play Music did not receive the metadata, YouTube surely did in 2016 when CD Baby published an art track on April 4th, 2016 and identified the copyright owner in the master as "Dead Day Revolution." One could argue again that a copyright owner in a master does not prove a copyright owner in the composition, and we'd agree. However, we do believe that CD Baby Publishing Administration, Dead Day Revolution's publishing administrator, did its due diligence in providing copyright ownership information in the metadata remitted to DSPs. We also learned that Dead Day Revolution opted in to the "Sync Licensing through YouTube Monetization" service offered by CD Baby Pro, which would have CD Baby match "Down the Road" with the YouTube Content ID system. CD Baby Publishing Administration also registered the song with ASCAP, which we quickly found in ASCAP's ACE Repertory. The listing identifies the writer (Michael Anthony Sandoz) and publisher (Dead Day Revolution Music) very plainly. One could argue once more that there should be a registration in the public records of the US Copyright Office as back-up when a service refuses to use all other resources, including resources that it owns, to identify the copyright owner in the musical work. 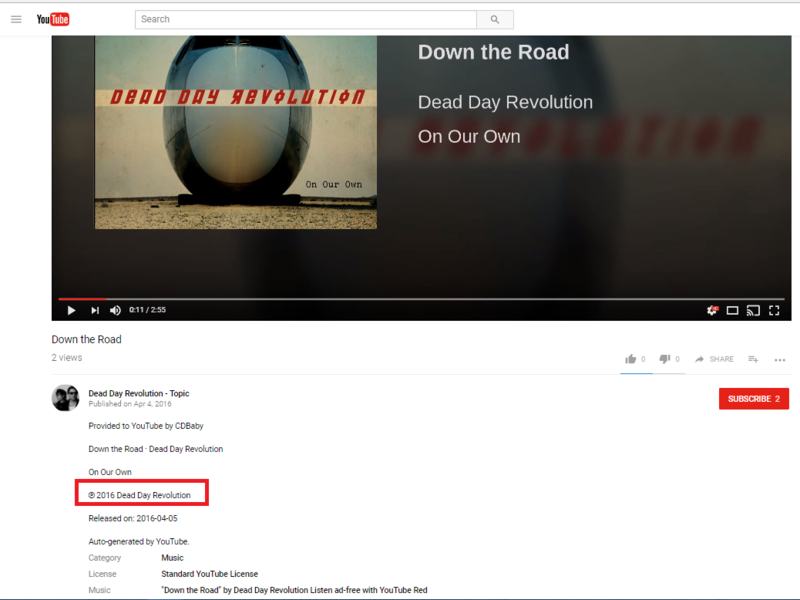 Well, after speaking with Mike Sandoz of Dead Day Revolution, we learned that the music work was, in fact, registered as part of a collection in accordance with the procedures and guidance of the US Copyright Office back in April 18, 2013. The registration listed the single claimant, Michael Anthony Sandoz, and his full address for the release "On Our Own," the same release delivered to Google Play Music and YouTube Music by CD Baby in April 2016. 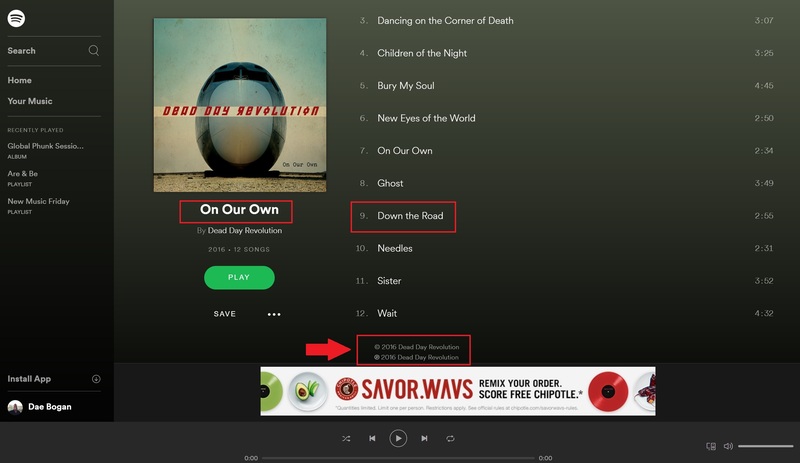 Google's original Section 115 NOI file showed that the author(s) and copyright owner of the song "Down the Road" by Dead Day Revolution, off the album "On Our Own" was unknown. 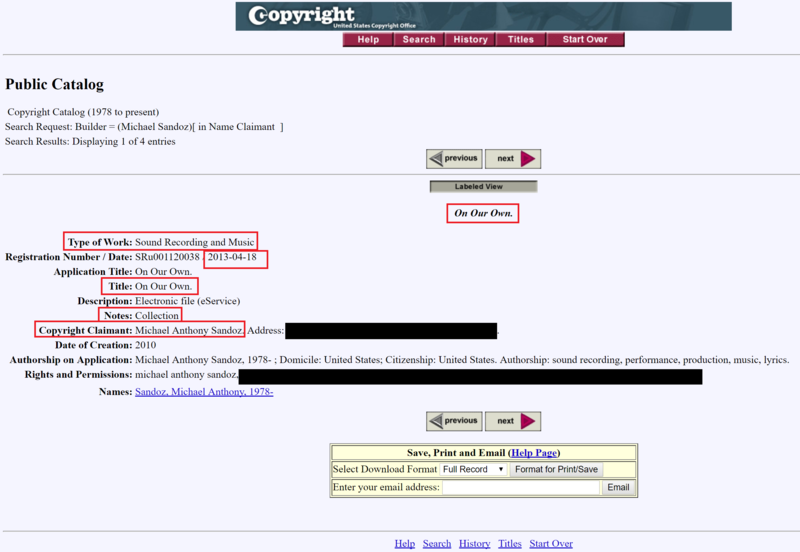 Had the largest data company in the world checked its incoming distributor release metadata (from CD Baby), ASCAP's ACE Repertory, or cross-referenced the release to the copyright registration of the same collection with the US Copyright Office public records, it would have saw that the author and copyright owner of "Down the Road" is Michael Anthony Sandoz. It appears that it was much easier for Google to include "Down the Road" in one of its nearly 7 million Section 115 NOI filings this year than to demonstrate to a DIY band that works so hard to be aware and diligent that Google is truly a partner. 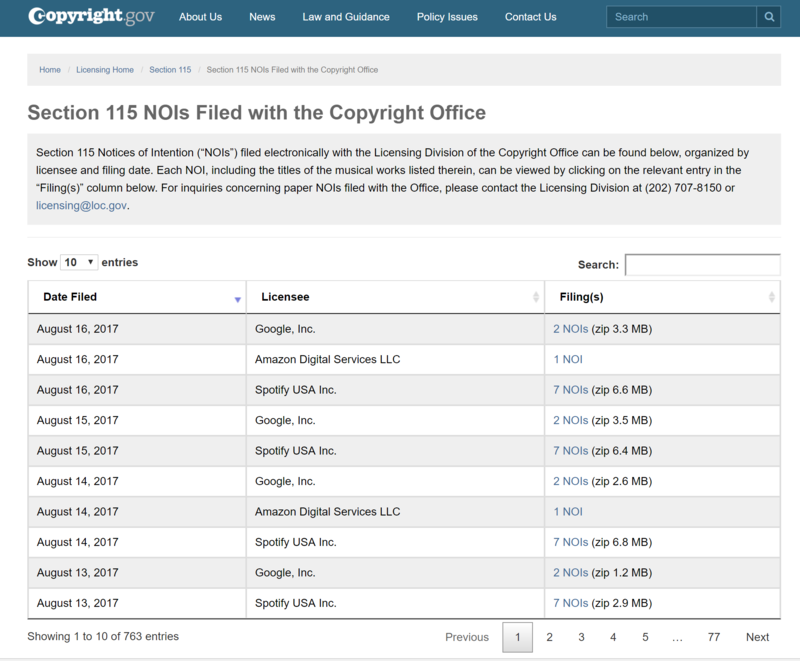 With rightsholder data disseminated across its Google Search, Google Play Music, YouTube Content ID, and in the records of Google's DMCA takedown system (the band told Royalty Claim that they have filed many takedown notices with Google for websites infringing upon their copyright in "On Our Own"), there is little reason why Google could not identify the copyright owner without willfully ignoring its own resources. 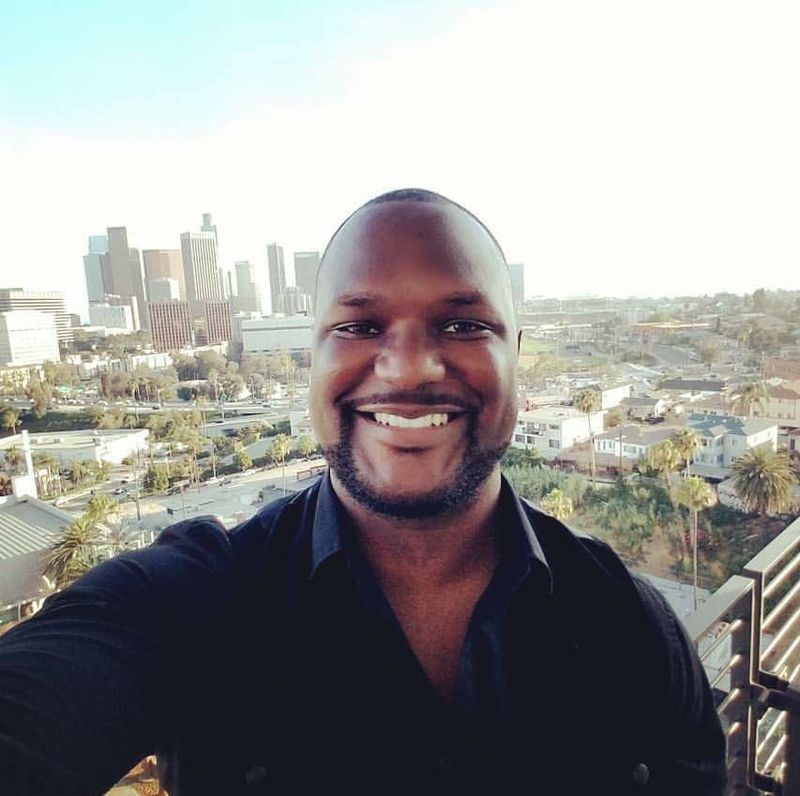 The business aspects of the music industry can be overwhelming for any artist. DIY musicians, especially, are challenged with wearing many hats as they act as their own manager, record label, music publisher, and often times their own booking agent. It is stressful enough balancing creation, promotion, and performing to have to also take on the complexities of navigating the music licensing ecosystem. And it is unfair that an artist that dares to be diligent still has the industry stacked against him. Mike Sandoz and Dead Day Revolution is the perfect example of a DIY artist that tried to do the right things. They partner with companies that champion the DIY spirit and any search of their works suggests that they've done their due diligence before their release. Nevertheless, after all was said and done, the industry proved that its inefficiencies and fragmentation is an exhausting burden that rightsholders must bare. We reached out to Dead Day Revolution after conducting some initial research into the matter. We talked with Mike Sandoz and explained what a Section 115 NOI was and why he had one sitting in row 50 of a 23,243 row MS Excel silently posted on the US Copyright Office website (before being ingested into the Royalty Claim Platform). Mike was very appreciative of our outreach and aided us by providing answers to a few questions regarding information that we could not access. We had a chance to chat with Mike candidly about his take on the state of the music industry for DIY musicians. Here's the interview.